Maintain several of your larger hanging baskets with help from these Panacea Round Coco Fiber Liners. This package includes 12 classic, round liners, perfectly designed for 16" diameter hanging baskets. 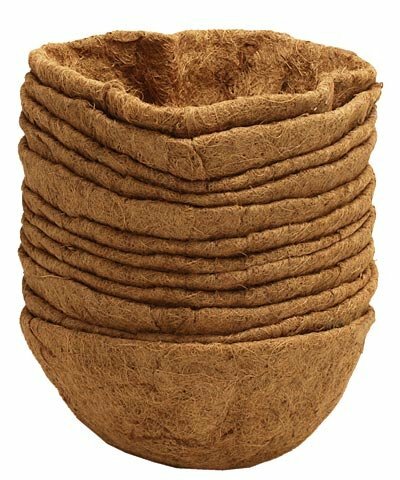 The coco fiber construction of each not only adds a traditional look to your baskets; it also helps keep your soil in place and retains some moisture for healthy plant roots. The brown hue enhances your flowers or herbs easily, and the 7.25" height reaches the rim of most standard frames. Keep your hanging baskets looking great for many seasons with these Round Coco Fiber Liners. This case pack includes 12 of the Panacea Round Coco Fiber Liners, 16" dia.